Royal Air Force Station Mendlesham, or more simply RAF Mendlesham, is a former Royal Air Force station located 5.5 miles (8.9 km) east of Stowmarket, Suffolk, England. Mendlesham airfield was built during 1943 and opened in late December of that year. Three RAF fighter squadrons manned by Czechoslovakian pilots moved in - No.310 flying Spitfire LFIXs and No. 312 flying Spitfire LFIXbs on 19 February 1944. No.313 flew in on 20 February with Spitfire IXs. No.310 finally moved out on 28 March 1944; Nos. 312 & 313 left on 4 April 1944. 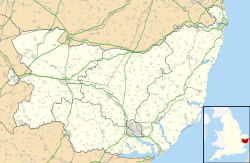 In March 1944, Mendlesham was allocated to the United States Army Air Forces (USAAF) Eighth Air Force. It was assigned USAAF designation Station 156. From 30 March 1944 though 11 July 1945, Mendlesham served as headquarters for the 93d Combat Bombardment Wing, 3d Bombardment Division, Eighth Air Force. The group flew both Boeing B-17 Flying Fortresses and Consolidated B-24 Liberators as part of the Eighth Air Force's strategic bombing campaign. Douglas-Tulsa B-24H-15-DT Liberator Serial 41-28851 of the 7th Bomb Squadron. This aircraft was damaged during a mission on 24 August 1944 and made an emergency landing in Sweden (MACR 8461). The aircraft was interned until the end of the war then repaired and flown back to the UK in 1945. The 34th flew 170 operations from the station, the first sixty-two while flying B-24 Liberators and the remainder with B-17G Fortresses. The change-over was made during the summer of 1944 when, in common with other groups assigned to the 93rd Combat Wing, the 3rd Division standardized on the Fortress. The group helped to prepare for the invasion of Normandy by bombing airfields in France and Germany, and supported the landing in June by attacking coastal defenses and communications. Continued to take part in the campaign in France by supporting ground forces at Saint-Lô, 24–25 July, and by striking V-weapon sites, gun emplacements, and supply lines throughout the summer of 1944. The group converted to B-17s in September 1944 and engaged primarily in bombardment of strategic objectives from October 1944 to February 1945. Targets included marshalling yards in Ludwigshafen, Hamm, Osnabrück, and Darmstadt; oil centers in Bielefeld, Merseburg, Hamburg, and Misburg; factories in Berlin, Dalteln, and Hanover; and airfields in Münster, Neumünster, and Frankfurt. During this period the group also supported ground forces during the Battle of the Bulge, December 1944-January 1945. In March 1945, with few industrial targets remaining and with Allied armies advancing across Germany, the 34th turned almost solely to interdicting enemy communications and supporting Allied ground forces. Before V-E Day, it carried food to flooded areas of the Netherlands (Operation Chowhound), and after V-E Day transported prisoners of war from German camps to Allied centers. The 34th Bomb Group returned to Sioux Falls AAF, South Dakota on 28 August 1945 and was inactivated. After the war, the field was used as the sub-site of No. 94 Maintenance Unit RAF being used as an ammunition storage depot. It was reduced to inactive status in June 1954 and sold. With the end of military control the former technical site of Mendlesham to the southwest of the airfield was developed into an industrial estate. Large, expansive buildings were constructed over the area, no wartime buildings remain. The balance of the airfield was returned to agricultural use; the runways, hardstands and perimeter track being largely removed for aggregate and today are fields, although parts of the perimeter track and the 02/20 runway remain as single-track farm access roads. No evidence of the wartime control tower remains. The NE end of the 20 runway has a small portion remaining at full width. A few wartime buildings are in use by farmers. Only the faintest hint of a perimeter track remains visible. A small but impressive memorial bronze plaque, subscribed to by the men of the 34th Group before their departure and erected in 1949 on the old airfield next to the A140 road, was stolen in April 2010 and presumably melted down for scrap. In January 2014 an appeal was started to raise £35,000 to replace it in the more secure location of St Mary's Church in Mendlesham. Some aerospace-related use still remains though: one portion of runway 08/25, although now covered with grass, is now in use by local microlight pilots and by Suffolk Coastal Floaters hang-gliding club along with a blister-type hangar at the EOR. Wikimedia Commons has media related to RAF Mendlesham.